Plants and soil absorb carbon dioxide, which helps mitigate climate change. But global warming will degrade that ability, scientists say. 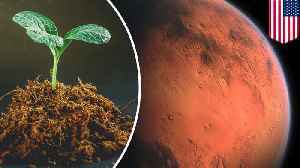 ORLANDO, FLORIDA — Researchers have developed plants that can produce nanomaterials which then give them extraordinary abilities that could allow them to someday grow on Mars. The study, authored..